I will qualify this review by saying that aside from the tour, the entire time we were in Arlington it was 100 degrees and I was a little bit dehydrated, despite having purchased a case of water when we landed in Houston. It’s just hotter than us New Yorkers ever, ever have to deal with. So if it is not as lengthy or detailed as other reviews, I apologize. 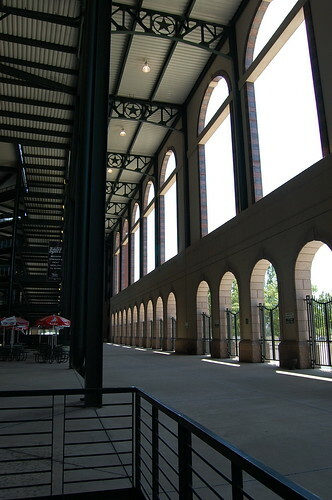 For example, we didn’t make a point of entering the stadium from the home plate entrance. I can’t even tell you what it looks like. We just entered the closest entrance we found because we were hot, tired, thirsty and wanted to sit down. 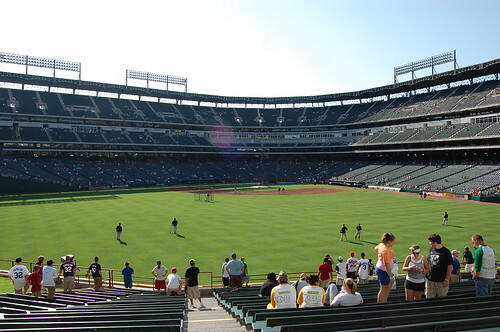 The Ballpark at Arlington is about a 3 1/2 hour drive from Houston. So if you’re in town for a series, why not skip a day, rent a car, and drive to this suburb of Dallas? Even if the team isn’t in town (which happens, the same way the Yankees aren’t at home when the Mets are) there would still be enough to make it worth your while. It’s located in the middle of nowhere. There are no stores or any kind of commerce in its immediate vicinity. We did find it easy to find and abundantly signposted, and there is commerce about a 10 minute drive away. It is across the street from Six Flags, and on the other side, the new football stadium. There are a couple of hotels in the immediate vicinity. (We chose to drive an hour back after the game so we didn’t have to do the entire drive the next morning.) The parking lots for those who aren’t season ticket holders or Lexus owners are very, very distant. They do run shuttles, but be prepared for a lengthy walk. There’s a parking lot map on the web site; it would do you well to study it and know where you want to park. 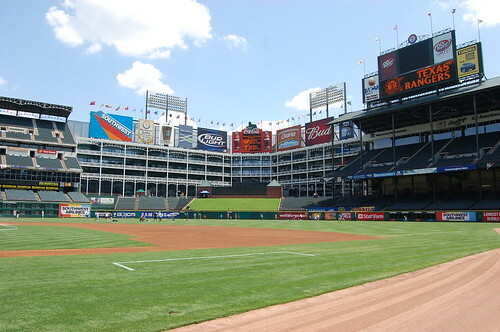 The outside of the Ballpark isn’t that impressive. 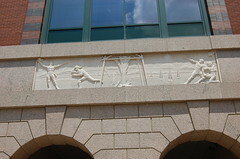 Aside from a few faux-historical friezes, it seemed like Early 80s Suburban Strip Mall to me. Inside, however, is another story. I thought it was beautiful and majestic and felt like baseball. The full photo set is here. 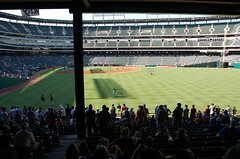 I loved the Ballpark. I loved the Tiger Stadium-esque porch, the bleachers in the outfield, the exposed steel detail, the offices out in center field. I loved the tour even more. We are ballpark tour junkies. We take them in the off-season if we happen to be in a town that has a park we haven’t seen. After the grand disappointment of the tour in Houston, we were thrilled to have an enthusiastic, knowledgable tour guide in Arlington. We drove up in time for the latest tour on game day – 2pm – and taking the tour on game day meant that we wouldn’t see the training room of the clubhouse. I’m told you don’t get to do more than walk in and walk out of those two rooms in any event. We still got to see the concourse, the underground tunnels, the tunnel to the dugout, the dugout, the indoor batting cages, the briefing room, the press level, and of course, a suite (in this case, belonging to the City of Arlington). The tour guide, Ed, was personable and knowledgeable. He was also, once upon a time, a Brooklyn Dodgers fan. Our guide seemed disappointed that we didn’t have any questions – but that was because he told us everything we wanted to know! Even with a large group (we had a church group as part of the tour), he kept things moving and made sure everyone could hear. Your tour ticket also you gets you into the Hall of Legends, which is a three-level baseball museum. The first floor has exhibits from Cooperstown (and considering that you are in Texas and not a lot of people there will ever make it to Cooperstown, it’s a good thing). The second floor is about Texas baseball, and has special exhibits (when we were there, it was the top 21 moments in baseball). The third floor is an educational center. Obviously we skipped the first floor and headed for the Texas baseball exhibit. It made our feeble Hall of Fame in the Diamond Club lobby look like the sad, pathetic gasp that it is. 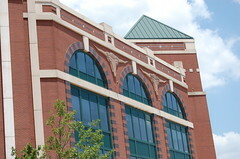 In the outfield is an office building that houses the team’s offices, but also the offices of just regular normal businesses. On the ground level is a picnic area and a play area for kids, with a tiny baseball diamond. Rangers Captain (it’s a horse) is often found out there. It’s also where the access to the outfield bleachers is found. 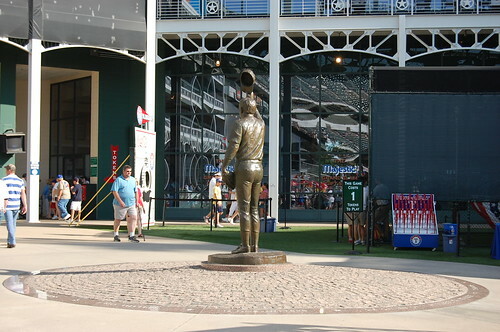 There’s also a nice statue of Nolan Ryan in the middle. The ballpark was built before the HOK open-concourse standard was a standard, so while the concourses are open and airy, you don’t have a view onto the field. There didn’t seem to be any policing of the aisles between at-bats, but we were pretty far out. It might be different if you were sitting in the infield. There is no retractable roof in Arlington. As per our guide, the people who owned the team at the time – including one George W. Bush – thought that baseball should be played outside. 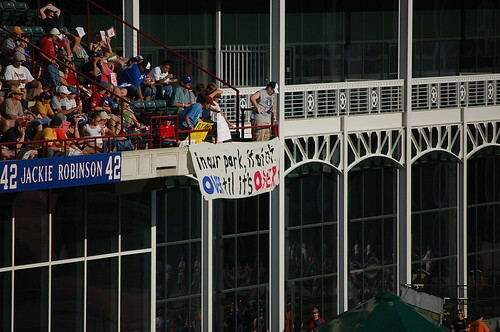 While I agree with that sentiment, when we were there, it was 99 at first pitch – which was 7pm. I can’t even imagine a 1pm game there in the summer. A local said, “You have to sit in the shade,” but I just can’t imagine being there in the afternoon in August. The team store is spacious and has a player number shirt available for EVERY PLAYER. What a concept. Field level tickets are more expensive than you would expect, so we chose the club level. If I had to do it again, I’d go sit out in the porch if I had to sit that far out. The porch at least looked like a lot of fun. 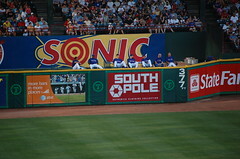 The Rangers bullpen is right in front of the porch, and the visitor’s bullpen is probably the worst I have ever seen, stuck in a gap between the field level seating and the bleacher level seating in left field. The Rangers give out free tickets to the best sign, so people are encouraged to bring them and they’re put on Diamondvision. The result is a lot of great signs (and a lot of lame ones too – but more clever ones). The official scoring is sponsored by – wait for this – Hooters. The incongruity of Hooters appearing on the Diamondvision five seconds after the Rangers finished welcoming The First Baptist Church of [insert city here] (they greeted 57 churches the day we were there) struck us as a little odd. They hand out ‘bingo’ cards sponsored by Hooters when you walk in, and the bingo squares are scoring options. Really seemed out of place. There is an enormous Starbucks ad above the offices in the outfield. However, there is no Starbucks in the park (that we could find, anyway). The giant Frappucino in the outfield taunted us when it was 99 at first pitch (as per the clock/temperature underneath the sign). I was told (by Mr. Lone Star Met himself) that the turkey legs at Arlington were a specialty. They also had garlic fries. By the time game time rolled around we were so dehydrated and hot that the last thing we wanted to do was eat, so unfortunately I cannot share with you the culinary delights of this ballpark. They did have Chicago-style hot dogs and the construction of same was enough to get my companion, who went to school in Chicago, to reconsider his decision not to eat. 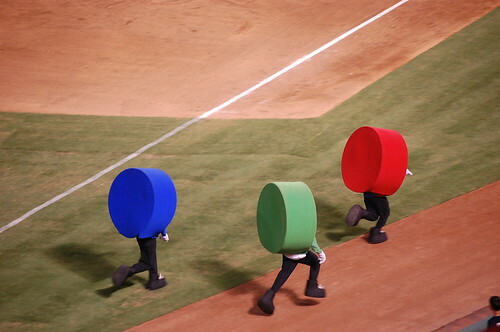 The in-game race event is the ‘dots race’ sponsored by the local bottled water supplier. It’s like the pierogie race in Pittsburgh where it starts on the screen and then finishes in the park. A country song is played after “Take Me Out To the Ballgame”. However, I can’t tell you which, because that was the time at which we decided we had been hot enough, long enough, and given that this was a game we cared little about, made the revolutionary decision to leave early. I really loved this ballpark and was just sorry I was too damn hot to enjoy it. 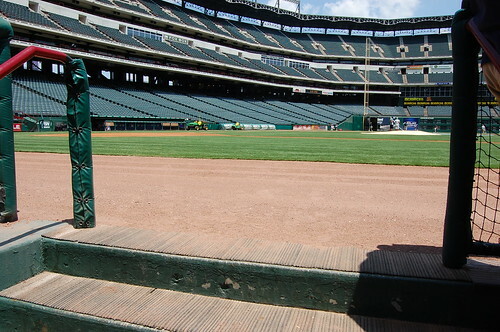 THE BALLPARK AT ARLINGTON: REVIEW.